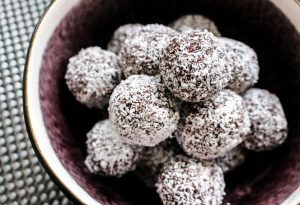 These bliss balls are handy to snack on and will keep for up to a week in the fridge in an airtight container. You can freeze them but don’t roll them in coconut until they have been defrosted as the coconut will become mushy once frozen and will lose its bite. Using a food blender, blitz all of the ingredients, except the coconut for a few minutes until you have a smooth paste. Taste the mixture to decide if you want it to be more chocolatey (add more cocoa powder) or sweeter (add more honey). If the mixture is too loose you can add some more ground almonds. When you are happy with the flavour and the consistency take a small amount in your hand and roll the mixture into small, bite-sized balls. Roll in desiccated coconut then transfer to a container. Place the bliss balls in the fridge for an hour or so to firm up.